Disability scholars, artists, activists, and students gathered at the Keywords/Key Questions for Disability Studies Symposium this October to discuss the future of disability studies. 2015 has been a landmark year for disability studies and activism both at Columbia and throughout the United States, as the U.S.’s foundational disability rights legislation, the Americans with Disabilities Act (ADA), turned 25 this July. The anniversary of the ADA, whose legacy is still the subject of much critical debate, coincided with the release of this summer’s Keywords for Disability Studies (NYU Press, 2015), a field-defining collection of essays co-edited by CSSD director Rachel Adams, along with Benjamin Reiss (Emory University) and David Serlin (University of California, San Diego). 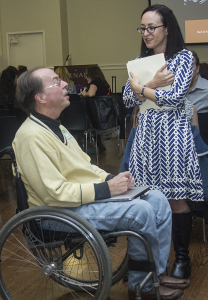 The fall semester also marked the launch of Columbia’s new University Seminar on Disability, Culture, and Society, following the conclusion of CSSD’s Future of Disability Studies Working Group last spring. In celebration of these new beginnings and opportunities for reflection, disability scholars, artists, activists, and students gathered at the Keywords/Key Questions for Disability Studies Symposium this October to discuss the next chapter of disability studies. Photos from that meeting are available here. The two-day symposium began with an artists’ panel on the evening of October 1, where artists Riva Lehrer, Park McArthur, and Sunaura Taylor discussed the key concepts that have informed their artistic practices as people with disabilities. The presentations and Q&A session covered a range of issues including inaccessibility in the art world, representations of people with disabilities in visual art, and the discursive divides between disability scholarship and activism. Picking up several of the conversations that began during the artists’ panel, the second day of the symposium offered a full day’s worth of talks dedicated to the major theoretical and political questions facing disability studies, featuring many of the writers who contributed to the Keywords volume. After an introduction from the editors of the collection, scholars Lennard Davis (University of Illinois at Chicago), Liz Emens (Columbia Law School), and Rayna Rapp (NYU) presented papers on issues of law and justice related to disability. The conversation focused on the politics of kinship surrounding disability, including racialized issues of access for adoptive parents, as well as the ways that disability rights protesting has been mythologized in historical accounts of the ADA. Later that morning, G. Thomas Couser, Sayantani DasGupta (Columbia University), and Janet Lyon (Pennsylvania State University) spoke about the implications of modern technology and medicine for disability studies, touching on the debate over facilitated communication technology and exploring the ways in which medical professional training enforces artificial divisions between health care providers and patients. In the afternoon, Heather Love (University of Pennsylvania), David Mitchell (George Washington University), and Katherine Ott (Smithsonian Institution) discussed the boundaries, borders, and definitions of disability theory, demonstrating how different institutional settings, such as the museum or the university, engender disparate approaches to communicating about disability. Panelists and audience members discussed both the potentialities and the limitations of academic discourse for conceptualizing disability and combating ableist oppression. The day concluded with a roundtable titled “Where Have We Been and Where Are We Going?” which synthesized many of the questions raised during the symposium. James Berger (Yale University), Chris Baswell (Barnard College), Michael Ralph (NYU), Benjamin Reiss, Maya Sabatello (Columbia University), and Joseph Straus (CUNY) reflected on previous talks and offered some new questions of their own, followed by an audience Q&A focused on the central issue of the previous talks: the relationship between academic disability studies and disability activism. Some participants stressed that the academic/activist divide is illusory, and that disability studies scholars have been central in organizing to make campuses more accessible. Others questioned how disability studies’ activist aspirations are constrained within institutions whose business models fundamentally disincentivize accommodations. Impassioned discussions continued to fill the conference hall even after the event had come to an official close, as participants and audience members worked together to envision new approaches to pedagogy and activism that tackle disparities of access in academia and beyond.